So far this year there has been a lot of new post-rock about. Latest releases from ...Trail Of Dead, The Rock Of Travolta and the mighty Mogwai have all been reviewed here. In addition, Grails have just released a new album – the excellent 'Deep Politics'; Earth, the Godfathers of post-rock, gained mainstream approval for their weakest album for some time; and maybe the best of all is the Sonic Youth soundtrack to the movie 'Simon Werner A Disparu'. 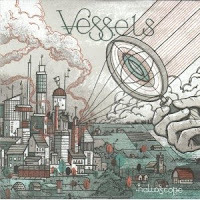 'Helioscope' is the second album from Leeds based five-piece Vessels and it enters the crowded post-rock arena with all guns blazing. Their sound is built on the taut but always expressive drumming of Tim Mitchell – in much the same way that Radiohead rely on Phil Selway – and they mix math rock forms with almost dance music melodies and ethereal vocals. 'Monoform' is a great opener and lays down pretty much the range of their sound. 'The Trap' follows and steps up the energy – it’s a really great song. Then the album wanders a bit – I don’t find the melody lines that convincing in several of the tracks - notably the significantly Radiohead-influenced 'Meatman, Piano Tuner, Prostitute' with guest vocalist Stuart Warwick, and the weak closer 'Spun Infinite'. That’s not to say the record is not well done – it is – but in following the tendency of nearly all the albums mentioned above whereby the rock in post-rock is offset by some more fragile element – cello, violin, voice – the risk is to lose focus. Maybe it’s a matter of taste and certainly this album is always interesting, but I think post-rock should be always challenging. The Sonic Youth soundtrack album is a master class in exactly how to pull all the pieces together to create beautiful music without compromise. But then again, they have had thirty years of practice. Purchase 'Helioscope' at your local record store, Amazon.co.uk, iTunes etc.